Immune Formulation 200 works to support the body’s immune system in the way that Nature evolved the Immune System. lutathione is one of the body's most important immune supports. Glutathione has over 15 immune-support functions. It is called the body’s Master Antioxidant or the Superhero of Antioxidants. 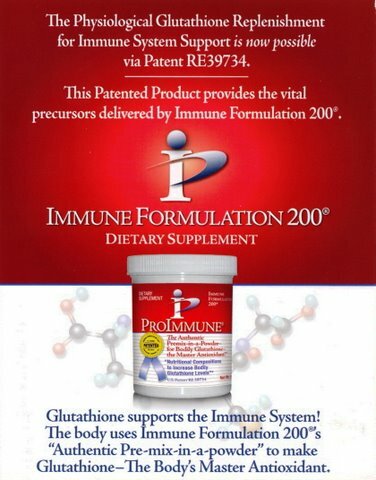 Immune Formulation 200 is the Authentic Premix in a Powder for Replenishment of bodily Glutathione. Immune Formulation 200 provides an efficient and economical delivery system for the replenishment of Glutathione. The broad and comprehensive Patent RE42,645E/RE39,734 is the basis for the novel Immune Formulation 200. This product utilizes a physiologically novel delivery system to bring the vital amino acids into the intracellular Glutathione synthesis chain. The company also announced that its motto "Immune Formulation 200 Supports Glutathione Production Every Physiological Step of the Way™" will accompany each order in newly designed literature. A 125-year-old scientific enigma was unraveled by Dr. Albert Crum, a Harvard educated physician/scientist to create Immune Formulation 200. This novel discovery decoded the pleiotropic paradox delivery system for the vital amino acids to physiologically enter the cell and become an integral part of the Glutathione synthesis chain. Immune Formulation 200 is protected by Patent RE42,645E/RE39,734, entitled "Nutritional or Therapeutic Compositions and Methods to Increase Bodily Glutathione Levels." The venerable John Wiley & Sons Company is publishing a book on Dr. Crum's pleiotropic paradox concept which underlies the Patent discovery. Glutathione is made naturally by the body within each cell (intracellularly). Immune Formulation 200 facilitates and supports the physiological way that the body replenishes its Glutathione. The immune priority for the body's Glutathione production is so high in Nature's evolutionary hierarchy that each and every one of the 300,000,000,000.000 (trillion) cells in the human body has been given the vital responsibility to make Glutathione. Immune Formulation 200 provides the precursors that the bodily cells need for the synthesis and replenishment of Glutathione.